For our developments, we distinguish the term “network emulation” from “network simulation” primarily on the real time nature of network emulation versus simulation. Most of our hardware in the loop (HWIL) developments require real time emulation — whereas OPNET and other products such as ns-3, are discrete event based network simulators that are not real-time. The differences between the terms network emulation and simulation are further described in the news post Network Emulation vs. Simulation. This network emulation typically occurs at the control plane for networked devices, but can also require emulation of the data plane such as when emulating the queuing and delay characteristics of a bandwidth constrained device to emulate and test network latencies representing the transfer of data over a wireless shared medium. The following paragraphs describe these custom real time network emulation developments. To craft different test scenarios, the content of outgoing messaging generated by the radio emulator application were soft coded with content specified by a loadable spreadsheet. The spreadsheet contents provided queue status and link quality metric values as a function of time with repeat patterns. Like a player piano, once emulation begins, beginning at the start of the next minute, the radio emulator provides queue status and link quality metric values based on the test defined sequences of values. Radio emulators allow for testing control and data plane interface messaging, timing, and concepts in advance of the actual development of a deployed radio. This introductory design and development effort is an important risk abatement process whose purpose is to work out many of the network interface protocols and behavior to inform the future system software design and development. 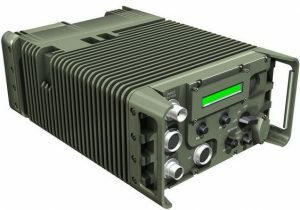 For the Defense System Networked Radio (DSNR) project, we developed as part of a broader simulation and emulation task, a radio emulator. This emulator was deployed on a network of Linux desktops to act as radios for real time emulation. The radio emulation application that executes on the hardware platform was written in C++ and used the wxWidgets cross platform GUI library for it’s user interface. The RF interface of the radios was emulated by a hard wired network connection between each Linux desktop by way of a secondary network interface card to a hub — thus representing a digital only lossless emulated RF test environment as the over the air interface. The primary network interface to the radio simulator provided a host facing interface to Cisco routers. The radio emulator provided a bandwidth constrained transmit path with delay and queuing characteristics that mimicked the characteristics of the target radio to emulate a wireless network. The networked radio to be developed, and by inference the radio emulator, had data and control plane exchanges with a host device by way of Cisco routers in a Mobile Ad Hoc Network (MANET) configuration. This is part of Cisco’s Mobile Ad Hoc Networks for Router-to-Radio Communications strategy. In this Cisco strategy, the PPPoE protocol is extended to enable a router or radio to query or report link-quality metric information. The MANET implementation uses PPP over Ethernet (PPPoE) sessions to enable intra-nodal communications between a device and its partner radio. Each radio initiates the PPPoE session as soon as the radio establishes a radio link to another radio. After the PPPoE sessions are active, a PPP session is established end-to-end (device-to-device). This procedure is duplicated each time a radio establishes a new radio link. The virtual multipoint interface (VMI) on the device can aggregate multiple PPPoE sessions and multiplex them to look like a single interface to the routing processes. Underneath the VMI are virtual access interfaces that are associated with each of the PPP and PPPoE connections. The radio emulator required developing the PPPoE protocol implementation between the radio and a directly connected paired Cisco router to achieve point to point links. To control the rate at which a sender can transmit data for each PPPoE session, extensions to the PPPoE protocol as credit flows (per RFC4938) were implemented as part of the control plane. The credit flow implementation minimized the queuing in the radio. In order to emulate the bandwidth constraints and delay timing of an actual radio, the data plane implemented in the radio emulator used a configurable delay mechanism between host data from the wired interface to the simulated wireless network. This allowed for evaluating credit flow and bandwidth limitations of the emulated wireless channel. 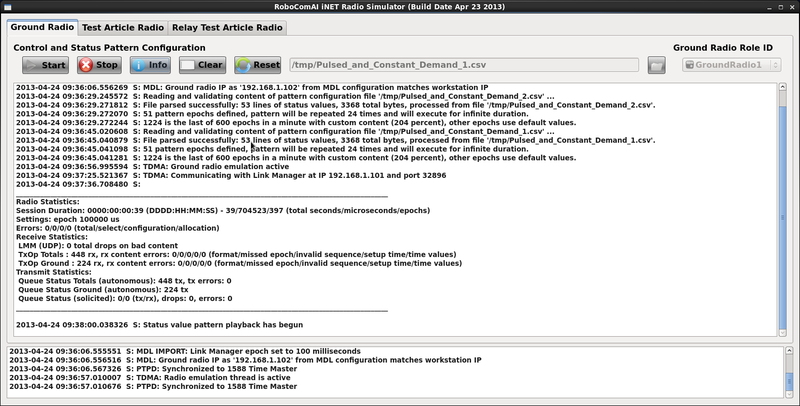 By emulating both the data and control planes of the networking radio, an inexpensive collection of Linux desktops was created that pioneered not only the technology necessary to be implemented in the actual radio, but allowed external upstream control systems to have a stand-in for testing and development. In addition, much of the developed source code from the radio emulator was utilized in the development of the actual physical radio firmware illustrating the importance of emulation/simulation at the physical hardware and networking layers towards a successful radio implementation. We were able to port the networking and web interface components of this telemetry receiver firmware based on the lightweight embedded Arch Linux operating system to a very low cost cluster of Raspberry Pi hardware running under a generalized distribution UbuntuMATE embedded Linux operating system. The radio emulator emulated in real time the control plane networking message protocol of the actual radios along with the web interface to permit testing out the telemetry receiver’s networking software at scale without tying up actual physical telemetry receivers. Simulation is a cost-effective method for developing, deploying and managing network-centric systems throughout their entire lifecycle. Users can evaluate the basic behavior of a network, and test combinations of network features that are likely to work. The telecommunications industry has recognized the strong benefits of network emulation as a risk abatement measure to the development of a network based product. Network designers are constantly challenged by the growing complexity of communications protocols and the increasing scale of network deployments. In order for network organizations to innovate, they need robust network emulation software to easily and intuitively model the intricate end-to-end behavior of protocols. The solution must also be able to efficiently analyze the performance of these protocols and technologies in network infrastructure models of realistic scale. 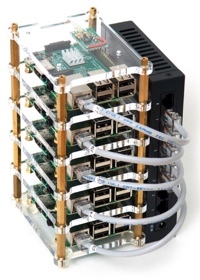 We have OPNET modeler emulation capabilities and expertise for testing out networking and communications protocols at scales that are difficult to replicate with hardware.